On November 7, 1774, residents of York boarded the British ship Virginia and dumped two half-chests of tea into the York River. The first Virginia Revolutionary Convention that met in August of that year had adopted a resolution to refuse to purchase English goods or consume tea, hoping to pressure the English Parliament to repeal tax laws and regulations that Virginia leaders believed to be unconstitutional. Later, committees in York and Gloucester Counties condemned the ship's captain for violating the Virginia boycott. They ordered the ship not to load any tobacco for shipment to England but to return empty. 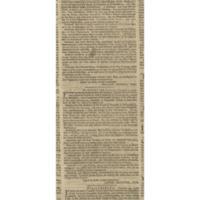 The committees' resolutions were published in Williamsburg's Virginia Gazette on November 24, 1774. Citation:Yorktown Tea Party, November 7, 1774. 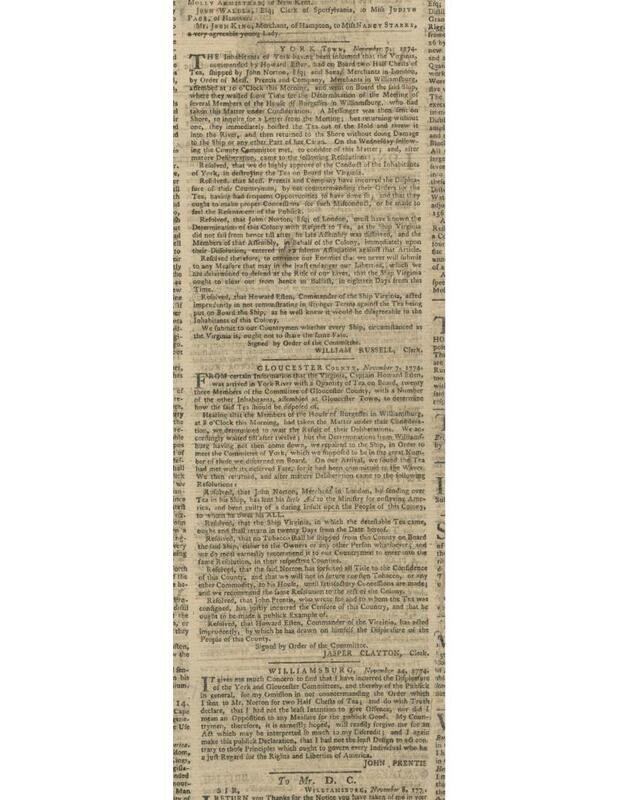 Notices pertaining to the Yorktown Tea Party, November 24, 1774, Purdie and Dixon, Virginia Gazette, page 2, Special Collections, Library of Virginia, Richmond, Virginia. Analyze: Compare and contrast the Boston Teaparty with the Yorktown Teaparty. What is similar? What is different? In Their Shoes: Imagine you are a merchant during the Revolution; what are some incentives to obey the non-importation agreement? What are some incentives to disobey the agreement? Current Connections: What are the current consequences for a merchant or company violating U.S. economic sanctions (e.g. Schlumberger Ltd)? 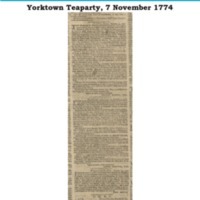 “Yorktown Teaparty, 7 November 1774,” Document Bank of Virginia, accessed April 21, 2019, http://edu.lva.virginia.gov/dbva/items/show/158.